President Donald Trump issued a "full [and] total" endorsement of Kansas Secretary of State Kris Kobach's gubernatorial ambitions on Monday. Trump, who took to social media to make the announcement one day before the Kansas Republican gubernatorial primary, praised Kobach, an early supporter of the president's 2016 campaign, as a "fantastic" candidate with "strong" stances on crime, immigration, and the military. "Kris Kobach, a strong and early supporter of mine, is running for Governor of the Great State of Kansas," Trump tweeted. "He is a fantastic guy who loves his State and our Country – he will be a GREAT Governor and has my full & total Endorsement! Strong on Crime, Border & Military. VOTE TUESDAY!" Kobach is challenging incumbent Gov. Jeff Colyer for the Republican nomination. Polling throughout the campaign has shown the two are locked in a close contest and the president's endorsement could prove pivotal to tipping the balance. Long a fixture in Kansas political circles, Kobach was the only statewide elected official to back Trump ahead of the state's 2016 Republican presidential primary. At the time, he cited then-candidate Trump's position on immigration as the catalyst for his endorsement. "For me, the most important issue in the Republican presidential contest is immigration and its effect on our national security," Kobach said. "On that issue, Mr. Trump stands head and shoulders above the other candidates." Prior to being elected secretary of state in 2011, Kobach worked on immigration policy, helping state and local governments crack down on undocumented migrants. The candidate has been cited for his role in aiding the Arizona Legislature in crafting S.B. 1070. The law, which was enacted in 2010, enabled law enforcement to determine an individual's immigration status during a lawful stop when there exists "reasonable suspicion" the individual is in the U.S. illegally. Portions of S.B. 1070 were struck down by the United States Supreme Court in 2012. As secretary of state, Kobach has championed voter ID laws in an effort to secure election integrity and prevent unlawful immigrants from voting. 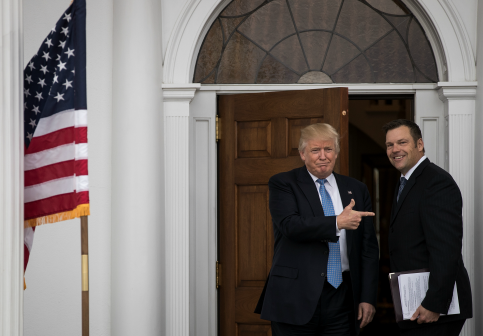 Kobach's election security initiatives and his strong stance on immigration made him a frontrunner to lead the Department of Homeland Security (DHS) after President Trump took office. The candidate said he turned down offers to join the president's cabinet in order to pursue higher elective office at home. In June 2017, Kobach signaled his intention to run for governor of Kansas. Initially, the race appeared to be wide open as then-Gov. Sam Brownback (R.) was term-limited from running again in 2018. The dynamics, however, changed in January when Brownback resigned to join the Trump administration and then-Lt. Gov. Jeff Colyer, who was already a candidate for the governorship, succeeded him. Since Colyer's ascendance, the governor's allies in Kansas and Washington, D.C. have attempted to thwart Trump from intervening in the primary on Kobach's behalf, fearful it would divide the party and allow for a Democratic upset in November, according to The New York Times. On Monday, Kobach responded to Trump's endorsement on social media by saying he was looking forward to partnering with the president if elected. "I look forward to working with President @realDonaldTrump to lower taxes, cut wasteful spending, and secure our border," the candidate tweeted. This entry was posted in Politics and tagged 2018 Election, Governor, Illegal Immigration, Immigration, Kansas, President Trump, Republican Party, Trump Administration. Bookmark the permalink.